This Cyclo Model 5, Mark II machine is fitted with two white standard carpet brushes for scrubbing with an action that cleans quickly without wear on the carpets or upholstery that would result if brushes were spinning. Also cleans tile, grout and other hard surfaces. 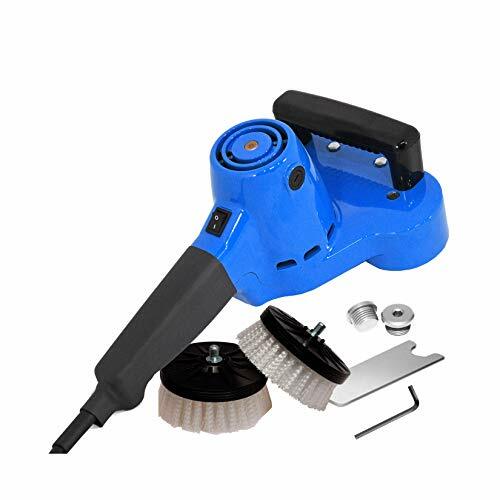 The synchronized movement of the Cyclo Polisher/Scrubber's dual orbiting heads effectively mirrors the overlapping, circular motion of hand scrubbing. The result is perfectly balanced machine that does an incredible cleaning job with little or no water required yet is fingertip controllable. Just think, with no liquid to extract, you finish the job without the drying time required when you spray and extract. If you do spray, then spray less, and extract more quickly and completely to clean soiled areas. While the Cyclo Dual Head Orbital Polisher has long been the secret weapon of choice in vehicular and janitorial cleaning, it is also legendary for its polishing capabilities. Attach one of its many accessories, and this incredible machine can cut, compound, polish and protect paints, metals and marine finishes. It's even found in hockey rinks the world over removing puck marks from arena boards. Nothing outshines the Cyclo Polisher. For scrubbing, polishing, versatility and value, the Cyclo Model 5 is in a class by itself. Intended for professional commercial users.